Ever since that glorious evening, I've been not so patiently waiting for Gardein products to be sold in a store near me. (Whole Foods, I love you...but you're so slow to get new products!) 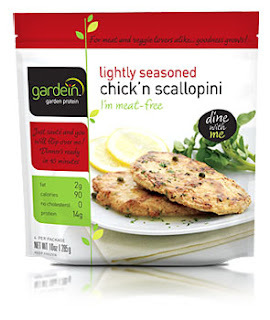 During my weekly trek to Whole Foods (in a snow storm, no less) I was SO excited to see Gardein Chick'n Scallopini in the frozen section. And what did I discover once I bit into one of these lightly seasoned, still ok if you microwave them and not bake them beauties? They're the same kind of chick'n patties my beloved Veggie Grill uses! Or at least incredibly similar. And freakishly good. This is now my absolute favorite frozen fake meat product. With only 90 calories per decent sized cutlet with only 2 grams of fat, I could probably eat these daily. Heck, after eating one, I could have eaten the other three cutlets that come in the bag because it was THAT good. It's so exciting to see various varieties of meat alternatives pop up...it's a far cry from my childhood when the options were so limited.